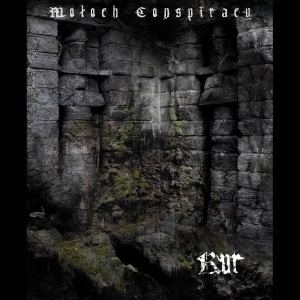 Nearly seven months after the fabulous album The Cave Of Metaphysical Darkness & Lights (http://www.concreteweb.be/reviews/moloch-conspiracy), which was released via Italy’s finest Eighth Tower Records, Julien A. Lacroix comes up with the next Moloch Conspiracy album, shortly named Kur. Once again it’s a conceptual recording, dealing with old Mesopotamian mysteries, cults and myths. More specifically, Kur deals with the ancient goddess Inanna, who descended into the underworlds, where her malicious sister Ereshkigal reigned. For this album, Julien found his inspiration in the legendary and mythical ancient stories of Inanna, as well as the occult and ritual aspects that were related to the netherworld, this kingdom of the dead, involved. This time, the recording sees the light via New Mexico-based Noctivagant Collective, a grandiose label specialised in aural rituals especially, once created for those who congregate in darkness… So, indeed Moloch Conspiracy fit to this roster. I do not know whether all copies are like mine, yet it is a truly beautiful, unique edition, with stunning artwork, yet hugely limited. So hurry up!!! Kur (named after the winged dragon, sometimes seen as the symbolisation of Death, and considered to be the brother of Inanna and Ereshkigal) starts with the title track, immediately expressing a descent to Hell in an aural way. It comes with the Lovecraftian aspects I like to refer to once in a while. The ‘song’ brings very ominous, gloomy synth lines, eerie drones and claustrophobic soundscapes that are both intriguing and yet suffocative. At the same time, this is ‘beautiful’ (indeed it is!) and terrifyingly oppressive. And yes, it also is dreamlike, mesmerizing, even transcendental! Hubur (which was the name of the river that led to the burning pits of the underworld) initially continues with a comparable obscure ambience, but it adds some additional elements: weird sounds, droning rumbles, samples (like water), haunting noises and ritualistic details. This piece, by the way, features Morego Dimmer aka Xerxes The Dark, a same-minded colleague / musician with a comparable vision of the darkest aspects of Aural Art. Fine! With Ereshkigal’s Children, Moloch Conspiracy delve deeper into the vile dungeons behind the blackest abyss. Little children’s voices, experimental strings, floating synths, bells / xylophone-alike percussion and distant beats get terrorised by screeching noises, creating an atmosphere that create hallucinogen dreamworlds, like an omen for an uncertain conflict to come. The duality in between the sonic experiments and the obscure soundwaves is grandiose, yet uncomfortable too. Ganzer’s Palace, then again, is much more transcendental and hypnotic once again. More than before, this track makes use of industrial sounds and esoteric elements, resulting in a semi-meditative aural dreamworld. The diverse types of percussion are disturbing, yet ethereal; the latter also strengthened by the floaty waves of synth-driven melodies. More like the first tracks from this album, Torments has that Lovecraftian attitude, that cavernous atmosphere of torment (not a coincidence, seen the song’s title), anxiety, uncertainty, despair and pain. In a morbid way, Torments combines nice droning melodies and spooky constructions of Dark Ambient, almost cynically insidious and delusive. …which brings me to the last composition on Kur, Offerings, once again with the frail voice of Uunslit. Besides, this piece is constructed out of so many details, several levels of deepness, atmosphere and content. Different layers of keyboards, a wide range of percussion instruments, almost exotic strings, sounds and samples, Offerings is the manifestation of a burdensome quest, which Inanna was subject to. From aural point of view, this hymn is like a symbiosis of the whole album, canalising all details that were part of Inanna’s mission.